Last week we covered the Autumn Budget highlighting the issue of low productivity. Defining the problem is one thing, addressing it is another. This week the UK Government released a detailed report highlighting their industrial strategy. The report lays foundations on ideas, people, infrastructure, business environment and places. The new strategy to ‘build a Britain fit for the future’ includes a mixture of existing and new policy ideas. It also involves investing more into Research and Development (R&D). Four key areas – artificial intelligence, clean energy growth, transportation and support for our ageing population – are being targeted. As well as addressing weaknesses, the report identifies key strengths, and the opportunity to build on a fundamentally strong economy in sectors like digital, construction, energy and education. The report coincided with an announcement that two large pharmaceutical companies will invest over £1bn in research hubs. The new multi-billion-pound life sciences sector deal will help support innovation in new treatments and medical technologies with the government and the private sector collaborating. The new plan also looks at international opportunities. Pooling knowledge and resources with countries such as the United States and China will spur breakthroughs in science and technology that otherwise may be held back due to lack of cooperation. The full 255 page report is available if you click on the link below. The Bank of England (BoE) conducted its annual banking system stress testing exercise. The good news is the Prudential Regulation Committee (PRA), responsible for supervising our major financial institutions, declared that the biggest lending banks are once again strong enough to weather a storm. BoE governor Mark Carney said that “UK Banks could continue to support the real economy even in the event of a severely disruptive exit from the EU”. 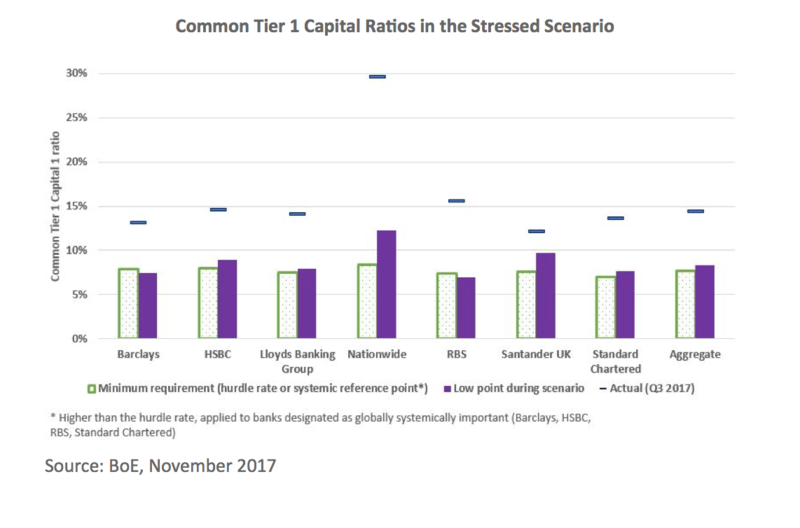 In our chart below the single horizontal lines represent the risk-weighted percentage of capital held on bank balance sheets as at the end of September 2017. The shaded bars represent what happens when the tests are applied. The unshaded bars represent the hurdle rate, and to pass the test the shaded bar needs to be higher than the unshaded bar. While most pass, some turn out stronger than others. 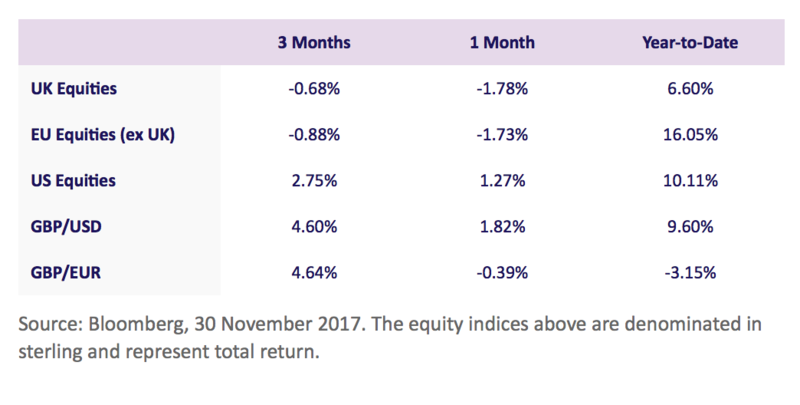 Even though Barclays and RBS are falling just short, BoE believe that both “have significantly improved their capital positions since the end of 2016. 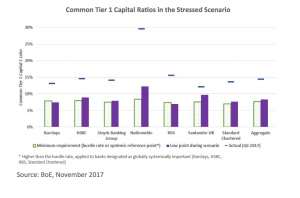 If the test were run on the basis of their latest capital positions, both banks would meet their capital ratio and leverage ratio systemic reference points”. The BoE also addressed the threat for incumbent banks coming from financial technology (FinTech) companies. They offer more efficient business models with reduced transactions fees. Competition from the rise in FinTech poses a risk on big banks’ profits, however, the PRA believe this will increase innovation and competition leading to lowers costs for consumers. Finally, while most UK citizens are blithely unaware of bank balance sheets for a secure economy to exist this arcane area cannot be ignored. The results are very reassuring for us all! 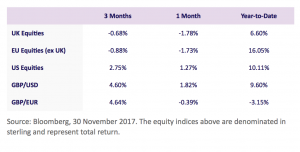 OIL SUPPLY – LOWER FOR LONGER? The Organisation of the Petroleum Exporting Countries (OPEC) and other non-OPEC members met gain in Vienna to discuss supply constraints. Their aim is to boost the oil price, which started rising after last November’s agreement (2016). Their actions play a large role, keeping production lower for longer and in turn underpinning current higher prices. Key threats to price levels include immediate supply increases from US shale and new oil fields coming on stream in Russia next year. However, the meeting concluded with production cut extensions until the end of 2018. 1) Both countries stick to the plan; the price is stable and profits are maintained. 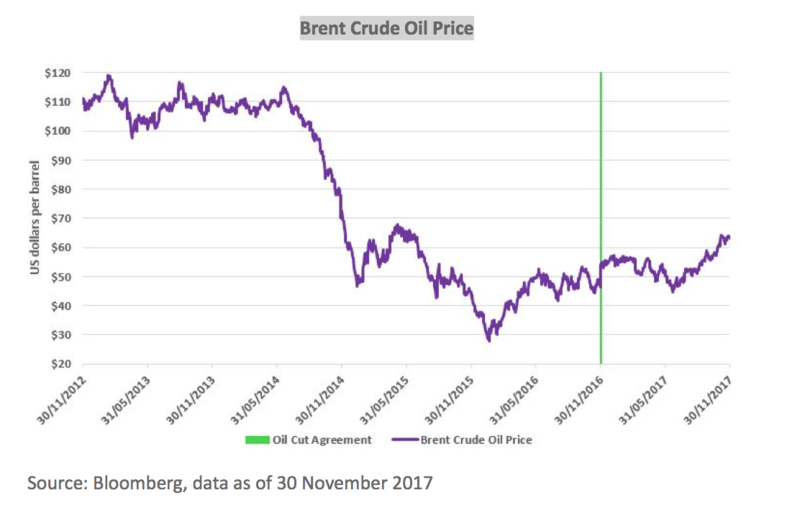 2) Russia cheats, discretely producing more oil at the expense of the Saudis; prices fall a little, but profits for Russia are higher gaining more market share. 3) As above, but with Saudi Arabia cheating. 4) Both start cheating; global production increases, prices fall a lot and profits are lower for all oil producers. Of course, this is just a simple theory with many external threats impacting outcomes. It does however indicate just how hard it is to predict the oil price. For now, the market seems to believe the agreement will stick until the next program review in June with Brent oil price increasing just marginally on the day by 0.73% to $63.57 per barrel.